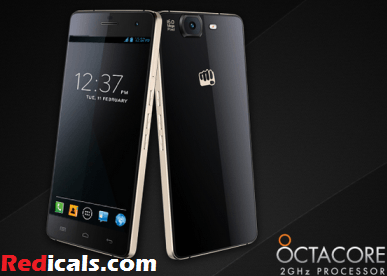 Micromax Canvas has launched it’s first octa-core processor smartphone, 5-inch full-HD display at Just Rs. 19,999. Micromax Canvas Knight support dual-SIM and runs on Android 4.2.2 Jelly Bean operating system. Micromax Canvas Knight A350 comes with 5-inch full-HD IPS display with 1080×1920 pixel density of 443ppi. Display:- Micromax Canvas Knight comes with 5 inch wide IPS Screen with 1920 X 1080 pixels screen. Software:- Canvas Knight runs on 4.2.2 Jelly Bean they might get some update in future. Hardware:- Canvas Knight comess with powerful processor Octa Core clocked at 2 GHz with Mali 450 GPU so that you can run any heavy application or any Game with high graphics and also comes with 2 GB DDR2 RAM which make running app smoothly. Camera:- Canvas Knight comes with 16 MP rear camera with LED flash and front camera of 8 MP which will help you to make video calls, also having features like auto focus and full HD Video recording and playback supported. Memory:- Canvas Knight comes with 32 GB storage in which 25 GB is available for the user but don’t have any external storage. Battery Life:- Micromax Canvas Knight comes with 2350 mAh battery which provides talk times up to 7.5 hours and in stand by 175 hours.